The tree-felling operation at Tomino has already started, despite protests by residents. Source: Stop GOK. Twelve kilometres from the city of Chelyabinsk, the Russian Copper Company (RMK) is planning to build a new ore mining and enrichment plant. This Urals city, where local residents claim there’s already nothing to breathe, is protesting how it can. But so far, they haven’t been successful in stopping RMK’s advances. Most of all, residents of Chelyabinsk and its surrounding villages are concerned by the tree-felling that’s already happening near the construction site — the green zone that allows one of Russia’s most polluted cities to breathe. 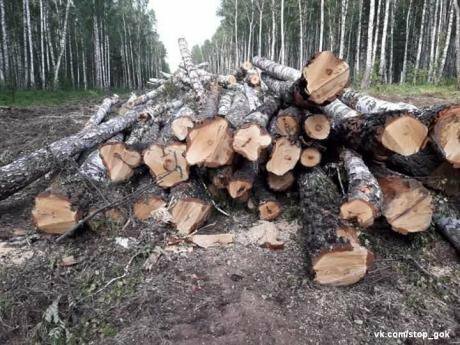 Thus, in 2017, nearly 4,000 residents filed a suit with the Chelyabinsk regional government to revoke the act permitting the zoning change that transferred these forests into a different category (which allows the company to cut down the trees near the site). 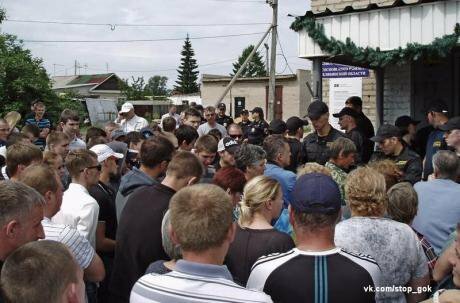 But on 1 August, the Chelyabinsk regional court decided against the residents, and the forest will continue to fall. Perhaps the struggle against the Russian Copper Company is doomed to fail because it’s so hard to identify its real owners — a situation familiar to many environmental activists. RMK’s shareholders are offshore firms registered in Cyprus, and the company is directed by Igor Altushkin (Russia’s 47th richest businessman, according to Forbes). Indeed, many residents of the South Urals call RMK the “Cyprus Copper Company”. Despite the fact that the levels of copper at Tomino, the proposed site for the mining and enrichment plant, are very low, RMK pursues its commercial interests fiercely. It seems in the long term the company intends to expand into mining silver and other precious metals. RMK is clearly attracted by the developed industrial infrastructure, which has long been in place in the region. Supported by local authorities, RMK is acting against public opinion and refusing to enter into dialogue with ecological organisations. As part of our coverage of Russia’s Year of Ecology, we talked to Andrei Talevlin, chairperson of For Nature, an environmental organisation based in Chelyabinsk — to find out more about the ecological threat posed by the Tomino mining complex, and why there’s grounds to doubt the legality of the project. Andrei, how did it happen that the plant is going to be built so close to the city limits? How will this proximity affect Chelyabinsk? The Tomino copper ore repository was opened back in 1957. And seeing as the environmental situation in Chelyabinsk was already poor, it was decided to assign Tomino reserve status — that is, until the Russian Copper Company started developing it. In terms of the impacts, first, the construction will entail felling forests at Tomino. In 2013, the chairman of the Chelyabinsk regional government Sergei Komyakov contacted Rosleskhoz [the federal executive body responsible for oversight of forestry issues] with a request to remove the protected status of the forests near the Tomino site. The federal agency approved this request, without any consultations with the local authorities. And now 15 square kilometres of Chelyabinsk’s suburban forest are to be cut down. November 2016: scenes from a rally against the copper enrichment plant, Chelyabinsk. Image: Andrei Talevlin. Second, the territory planned for the plant’s construction is currently the only complete green zone near Chelyabinsk. The enrichment plant will work through 28m tonnes of ore a year, and will operate for 50 years. This is the biggest project of its type in Russia today, and the only one next to a city with a population over a million. What threat does this pose for city residents? Well, imagine this: everyday, thousands of tonnes of dust will be pushed up into the air from quarry explosions, the enrichment plant and adjoining facilities. This dust will spread over many kilometres via air currents. And there’ll be nowhere for polluting materials to settle — the nearby forests will have been cut down. Western winds predominate in this climatic zone, and so this dust will naturally gravitate towards Chelyabinsk. The plant’s waste will also, of course, present a danger to the environment — we’re talking about various acids, arsenic, lead, cadmium, mercury and several dozens of other harmful substances. Does the project contain any provisions for preventing ecological risks? More like the other way round. It’s clear from the project at hand that the risks will be huge — and there are, as yet, no plans to deal with them systematically. Right now, RMK plans to build two huge quarries, an enrichment plant, a hydrometallurgical factory and a huge tailing pond. A tailing pond is a big lake filled with liquid waste products, chemical products left over after enrichment. When a similar tailing pond burst open at Ajka, in Hungary, in 2010, it led to an ecological catastrophe, with toxic waste poisoning a significant area — the harm still hasn’t been fully accounted for. June 2017: public hearings at Voznesenka village, Chelyabinsk. Source: Stop GOK.The way the Tomino tailing pond has been designed so far presents a real threat. In terms of size, it’ll be three times the size of the only water source for the 1.5m people who live in this district, the Shershi reservoir. Given the quarries will be next to this reservoir, leaks from various sides of production are likely to find their way into the main water artery for Chelyabinsk. One of the dams planned for it is to be nearly 100m high. Representatives of RMK claim that they’ll review the project — but there’s no new project as such yet, and the old version has been approved by all the necessary ministries. What do residents of Chelyabinsk and the region think about this new plant? In my opinion, the majority are categorically against it. This is obvious if you look at the opinion surveys. Even the Russian Public Opinion Research Center (VTsIOM) was forced to recognise in 2016 that the majority of people surveyed in the region do not support the Tomino project (and that’s with the loyal position of that particular centre in mind). Another survey, carried out on the initiative of the local authorities of Poletaevo village district is even more revealing. The residents of Poletaevo and other nearby villages were asked about their attitudes to the copper enrichment plant. The majority responded negatively. A similar survey was carried out in the village of Voznesenka, which will also be influenced by the plant. The response was also negative. It’s worth noting that these were official polls, as dictated under municipal legislation, and the results were confirmed by the local authorities. "The villagers, country-house owners and even the city people feel intuitively that the result of this development will be catastrophic"
Meanwhile, the public hearings on this issue have been constantly moved around. The first hearings were held in Tomino in June 2012. Out of the villagers present, no one understood a thing — even their official representatives. Back then, no one suspected that the project would reach the scale that it has, or that the consequences would be as damaging. The initial hearings were quiet. As soon as it became clear what RMK were up to, the local population’s attitude turned, obviously, negative. Since then, the investors have done everything to suppress any dissent at its core. For instance, big public hearings on the plant’s plan were planned in 2015 for the middle of the working day and a location that is impossible to reach via public transport. The documents destined for public consumption were practically impossible to access — they were kept in the Tomino village administration building, and were not uploaded to the internet. So basically, the only way you could get them was to go during the day, during the week — and you were banned from taking copies. Moreover, you need to understand that it’s the institutions of local self-governance that organise these hearings officially. And legally they have no link to the client behind them, RMK. Yet in the case of the Tomino plant, the authorities have clearly taken the side of the offshore company. Group "UltraSi" perform a protest song against the Tomino Mining Complex. Source: "UltraSi" / Youtube. There have been other manipulations of public opinion. All the petitions by independent civic organisations to be included on the public hearing organising commission have been refused straight off. And meanwhile, otherwise unknown representatives of civil society arrive at the hearings, together with security guards from RMK, in a very organised manner. These representatives of pseudo-public opinion, as a rule, are following exclusively their own personal — and often profitable — interests. And these “representatives” never get into the problems facing Chelyabinsk. State institutions actively support and use these figures and their organisations. In essence, this is the expansion of ignorance, rudeness and lack of principles into the healthy forces of society. But even these artificial barriers failed to guarantee legitimacy for the approval of the project via public hearings in 2015. People managed to get to the hearings location (after taking four different buses) and made their opinion heard forcefully. This is understandable: not everyone is ready to hand over thousands of hectares for barbaric destruction. The villagers, country-house owners and even the city people feel intuitively that the result of this development will be catastrophic. And no fancy films (shown to them during the hearings), nor overtures from RMK representatives to the effect that everything will be fine – have convinced them. The threat to the Shershnev reservoir, ground pollution for many kilometres, additional air pollution was clearly there in the hall next to the flowers and birch trees that were shown on the screen. The majority of those present said no to the plant. Even with people specially bussed in, when the question was posed to the audience, the majority of people were against the Tomino plant. How has RMK managed to get this project confirmed? It seems that the client behind RMK’s project, and Russian state institutions, are obliged to stop the project. This is demanded from Article 2 of the Russian Constitution: the duty of the state to defend the rights and freedoms of its citizens. But instead, the authorities and RMK have come up with another move: an ecological audit. According to legislative norms, an ecological audit — an independent evaluation of how ecological demands will be observed — can only be carried out at an already operating production site. And in our case, it’s been decided to evaluate the project, which isn’t guaranteed by law. It seems they just liked the name. 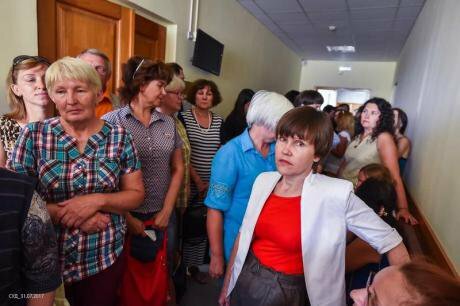 1 August: citizens gather at Chelyabinsk regional court after a record number of citizens filed a case against the Tomino forest re-zoning decision. Source: Igor Yadroshnikov / Activatica.It was the governor of Chelyabinsk region, Boris Dubrovsky, who initiated the audit. The Mining Institute of Ekaterinburg won the tender — and the institute, by a strange turn of circumstance, enjoys, among others, the sponsorship of RMK. The auditors have given their overall approval to the project, and recommended that the client ditch the hydrometallurgical plant, as well as proposing to situate part of the waste cycle in another quarry. These recommendations have so far remained on paper, and haven’t been included in the project yet. RMK, which doesn’t yet have building permission, is planning to fell more trees very shortly. The Chelyabinsk regional prosecutor’s office has already told local residents that “everything is lawful”. And on 11 July, the director of RMK Igor Altushkin, together with the regional governor and Russia’s minister of industry and trade Denis Manturov, announced the launch of the project at Innoprom-2017, an international industrial expo. How is your organisation fighting against this project? In December 2013, For Nature conducted the first open public hearings. We just used the norm written into national legislation. And we had representatives not just from Chelyabinsk region, but Kurgan, Sverdlovsk regions too. RMK, it should be said, ignored these hearings. After these hearings, there emerged a civic movement called “Stop GOK” — and their representatives started promoting information for the active part of the local community. There was a big response. People came out to rallies, organised pickets, asked for help from the local authorities — but so far, it’s been unsuccessful. Back then, 108,000 people signed a petition against the plant addressed to the President. And we received a response from the presidential administration that the project had passed all the stages and there were no violations. "Once again, as has happened in the past, the law is becoming a weapon of Russia’s ruling class, and the state is transforming into a tool to destroy nature"
For Nature tried to conduct a public ecological inquiry of the entire project. We legally registered an expert commission, and informed the local administration as necessary. However, RMK did not present the design to independent experts. Civic activists appealed to the regional arbitration court, and won the case. So, there is a court decision that enforces RMK to present documentation to For Nature, but a year on, this decision still hasn’t been enforced. Moreover, at the end of 2016, our organisation was liquidated by decision of the regional court, after a case was put by the local ministry of justice. Two violations were found, and we were liquidated instantly without any demands or communication. Today, activists from Stop GOK are conducting court cases against the legal decisions made by the authorities and the oligarchs (which, in Russia today, are unfortunately the same thing). There are cases from citizens and civic organisations sitting in the Chelyabinsk regional court and Supreme Court. But in the current conditions, there’s not much point relying on the courts to defend the rights and interests of citizens. The example of how ecological rights are violated in Russia shows us how society is gradually moving away from the principle of the rule of law. Once again, as has happened in the past, the law is becoming a weapon of Russia’s ruling class, and the state is transforming into a tool to destroy nature.